The vice presidential candidates get heated talking about overhaul proposals of the nation's Medicare system. Vice President Joe Biden came out swinging against his Republican opponent, Paul Ryan, in Thursday’s lone vice presidential debate with a readily evident determination to avoid repeating President Barack Obama’s laconic performance in last week’s presidential debate. Biden went at Ryan, a Wisconsin congressman who agreed to serve as GOP presidential nominee Mitt Romney’s running mate two months ago, from the very outset of a freewheeling debate in Danville, Ky., that saw the two candidates bicker frequently and differ sharply on policy and politics alike. Poll: Did the vice presidential debate influence who you will support in the election? The vice president threw up his arms, laughed, scoffed and rolled his eyes in reaction to Ryan’s attacks – an unabashedly reaction to what Biden frequently called “malarkey” offered up by the House Budget Committee chairman in his opinion. During Thursday's debate, Vice President Joe Biden and GOP vice presidential nominee Paul Ryan spar over the Obama administration's foreign policy. The debate featured many of the fireworks that last Thursday’s initial debate between Obama and Romney had lacked. While Ryan stuck to familiar talking points used often by Romney on the stump, the vice presidential nominee hardly shrunk from engaging with Biden but largely engaging the vice president’s bombast. The 90-minute affair at Centre College saw both Biden and Ryan playing to type. Biden was emotional and folksy but could barely contain his reactions to his opponent. Ryan maintained a more earnest demeanor, and often turned to statistics and anecdotes to make his case as the discussion shifted from events in Libya to Medicare and abortion. Vice President Joe Biden plays off of Lloyd Bentsen's 1988 jab at Dan Quayle while debating GOP vice presidential nominee Paul Ryan on Thursday. Ryan stuck largely to familiar and well-studied talking points used often by Romney and the GOP ticket on the campaign trail, but showed no interest in shrinking from the vice president’s bombast. The congressman stuck to his expertise as a budget wunderkind to explain reforms to entitlements and taxes and balancing the budget. 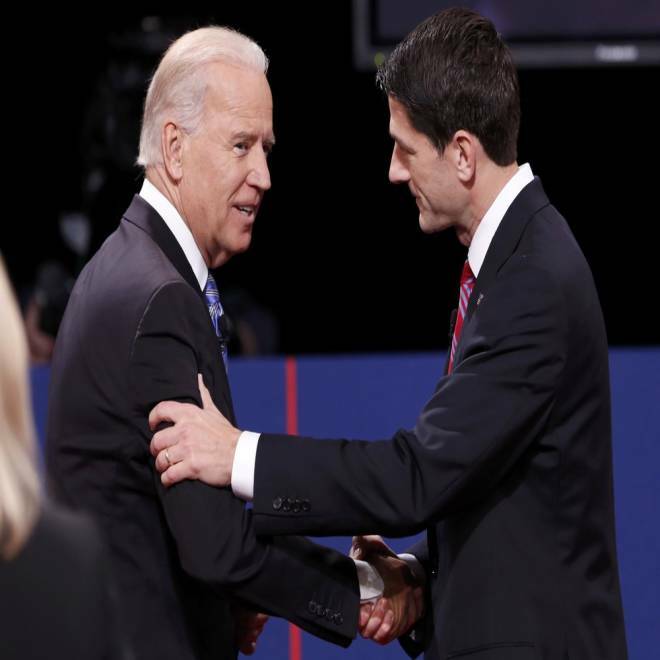 Biden has been a frequent critic on the campaign trail of Ryan’s two budgets for their proposed changes to Medicare. The most recent version of the proposal would offer seniors a rebate to buy insurance on the private market, or opt into a Medicare program as it’s more traditionally known. Vice President Joe Biden and Republican vice presidential nominee Paul Ryan shake hands at the conclusion of the vice presidential debate in Danville, Ky. The vice presidential debate set the stage for the two remaining contests between Obama and Romney left before Election Day. The first of those debates is on Tuesday, where Obama will hope to channel the energy displayed by his vice president this evening. Ryan, meanwhile, will join Romney for a joint rally on Friday in the all-important swing state of Ohio, where both men have concentrated much of their efforts lately in a bow toward the state’s central role in charting a path to the 270 electoral votes needed to win the election.